Anthropocene examines the acceptance of what is outwardly visible versus what’s beneath the surface. Jonas Hart, Dameon Lester and Melissa Loop illustrate the significance of the larger picture, the systems or the emerging meaning. How aware are we of our influence on the landscape? Whether it’s an underground water system that is never seen, a far away place that seems pristine or the tip of an iceberg’s assumed permanence, the human animal has put our stamp on the world. Austin’s many creeks and waterways are well known for their scenic beauty and recreational value - they are also the groundwork for massive water management systems enhanced through years of human expansion and fortification. This work is part of an ongoing exploration the infrastructural tokens - drains, culverts, manholes, etc. - that are often the only visible manifestations of the underlying water infrastructure that form our integral relationship to landscape. 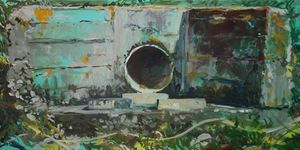 Working recently from features found along a drainage running through North Park Trail in Anderson Mill, each of the paintings and sculptures represents an original referent object on a one to one scale. The sculptures remove found infrastructure elements from niches in the larger landscape. Isolated from their original surroundings, their crudeness and sometimes arbitrary construction becomes more apparent and the wearing of time and the elements are highlighted as painted features. Scattered throughout the gallery, they act as a crude restaging of their reference landscape. The paintings each begin with a prime layer based traditional infrastructural marking colors. Caution yellow, utility orange, sewer drain blue/green - each prime color is left visible at the edges of the paintings and peek through the layers that build each image. 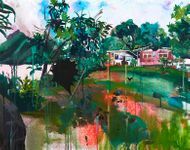 While each painting depicts an isolated structure, the edges bleed into their surrounding landscapes. The marks that form each image aggregate loosely, building up and deteriorating simultaneously - a reminder of the instability of the structures over time. Examining closely the features of our infrastructure, the extent of our integration with our landscape is made concrete - massive and fragile. Our perceptions of existence are bound by our humanity. These limitations prevent us from comprehending the greater resonance of our actions. My sculptures suggest an uneasy continuum between the known and unknown, as well as the controlled and controlling elements of the world that surrounds us. 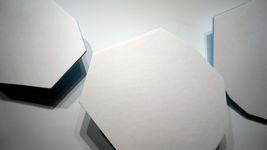 These minimal forms abstract the glacial ice sheets, fragments, and crevices encapsulating the increasingly ephemeral quality of nature's assumed permanence.